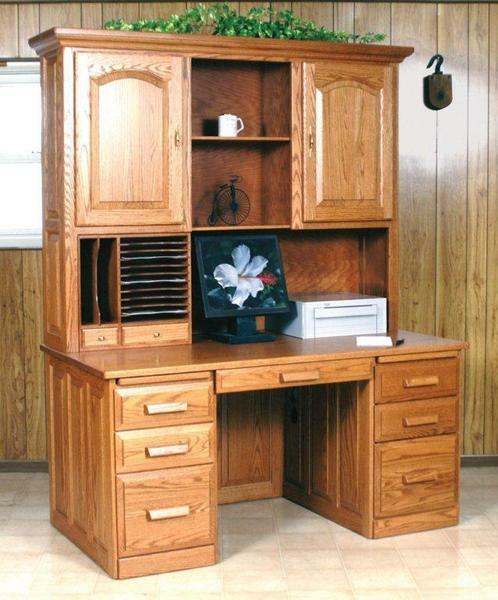 Amish Flat Top Computer Desk with Hutch Top Choose 56", 62" or 68"
This traditional looking computer desk has a hutch top for plenty of storage space. This desk is available in a variety of wood types and stain choices as well as custom stains upon request. Choose from three sizes! Dovetail drawers with full extension slides, raised panel sides and plywood back are standard. This is an excellent quality desk that will last for generations! Please call one of our Amish furniture specialists with questions on our office furniture. They are happy to assist in any way that they can. After an order is placed, finish samples will be mailed to confirm your selection.